I figured it'd something to with HP! Suits the blog, Avada Kedavra is too cliched. 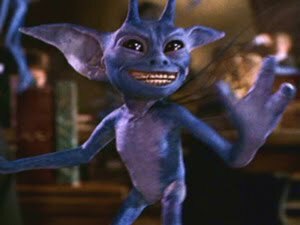 I think they made one basic ugly creature and just modeled it into goblins and elves and pixies. Pixies don't usually look so! That's true!!! That pixie does look a LOT like Dobby!! The book tells that Lockhart purposely let the Cornish Pixies loose so it wasn't accidentally done. Well, I guess I didn't read the Harry Potter books as thoroughly as I thought I did! Now that you mention it, I guess he let the pixies out to see how the students would deal with them and then things got out of hand. Is that correct?